Jump onboard this whirlwind tour as we fuse the fast pace of Tokyo with the serenity of Mt Fuji and three must see fixtures over six days. With a chance to see Australia, Georgia, England, France, Scotland and tournament hosts Japan in action this is a rugby fanatic’s dream! Our Tokyo-Fuji Fusion tour is for those who have limited time, but want to experience as much Rugby World Cup 2019 action as they can. 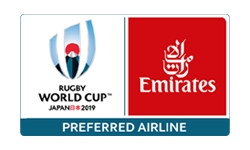 With a day trip to Japan’s majestic Mt Fuji combined with three matches in 3 days, this six day tour gives you the perfect taste of Rugby World Cup 2019, Japan.